Over 100 works of art reflecting the Stenzels’ interest in visual imagery of the American Northwest of the 19th and early 20th centuries. Dr. Franz Stenzel, a Portland, Oregon physician, and his wife, Kathryn Mathison Stenzel, began collecting art of the American Northwest in 1955 shortly after Dr. Stenzel was given a painting by a patient. Over the next 40 years, Dr. and Mrs. Stenzel amassed a collection that eventually included more than 2,000 works of art. 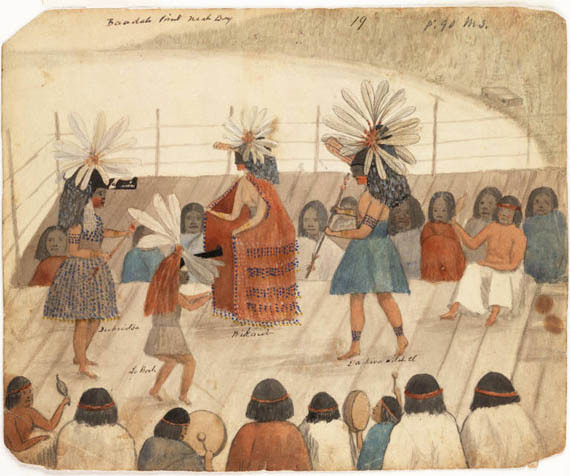 They focused on depictions of the Pacific Northwest made in the 19th and early 20th centuries. Although they never completed a projected book about artists born before 1900 who worked in the U. S. and Canadian Northwest, their research contributed to two books by Dr. Stenzel: Cleveland Rockwell: Scientist and Artist, 1837-1907 (Oregon Historical Society, 1972) and James Madison Alden: Yankee Artist of the Pacific Coast, 1854-1860 (Amon Carter Museum, 1975). In 1997, after they had pared the collection by sale and donation, Dr. and Mrs. Stenzel donated most of their remaining collection of original art and their research files to the Yale Collection of Western Americana. Additional works of art were received as a bequest from Mrs. Stenzel in 2007. The approximately 1900 works which came to Yale reflect the Stenzels’ interest in visual imagery of the American Northwest in the 19th and early 20th centuries. They include numerous works by such western artists as James Madison Alden, E. A. Burbank, James Montgomery Flagg, Joseph Kehoe, Hans Kleiber, William Forsyth McIlwraith, James Henry Moser, E. S. Paxson, Lute Pease, Cleveland Rockwell, James Everett Stuart, James Gilchrist Swan, Peter Peterson Toft, Daniel Winter, and Charles Erskine Scott Wood. The roughly 150 digital images gathered here draw heavily upon the work of 19th century ethnographer James Gilchrist Swan and his Haida interpreter Johnny Kit Elswa. Swan, who moved to the Olympic peninsula of Washington Territory in 1852, was fascinated by the Native Americans he encountered. He spent the remainder of his life studying their art, material culture, and history. He lived among the Makah Indians of Neah Bay, where he taught school, and was one of the first Americans to visit the Haida villages of the Queen Charlotte Islands. The author of several books, Swan became the Smithsonian Institution’s principal agent in the Northwest. An avid correspondent and diarist (he kept a daily journal for the last 41 years of his life), Swan was also an able draftsman who sketched many of the people he met, the places he visited, and the events he witnessed. He also commissioned and collected works by Indian artists he befriended, including drawings and watercolors by Johnny Kit-Elswa, a young Haida silversmith. For more information about Swan, consult Ivan Doig, Winter Brothers (New York, 1980) and George Miles, James Swan, Cha-tic of the Northwest Coast: Drawings and Watercolors from the Franz & Kathryn Stenzel Collection (New Haven, 2003). Franz R. and Kathryn M. Stenzel collection of western American art. Yale Collection of Western Americana, Beinecke Rare Book and Manuscript Library.